Parmesan Sweet Potato Fries - crispy and cheesy sweet potatoes and topped with Parmesan cheese, perfect side dish and so easy! I recently got a new toy in my kitchen, Philips Viva Digital Air Fryer from my friend at Philips. I have wanted to get an air fryer for a long time, so I was so excited to have it in my kitchen. Not many people like frying in the kitchen, and deep-fryer wastes too much oil and such a hassle to wash as it’s so greasy. 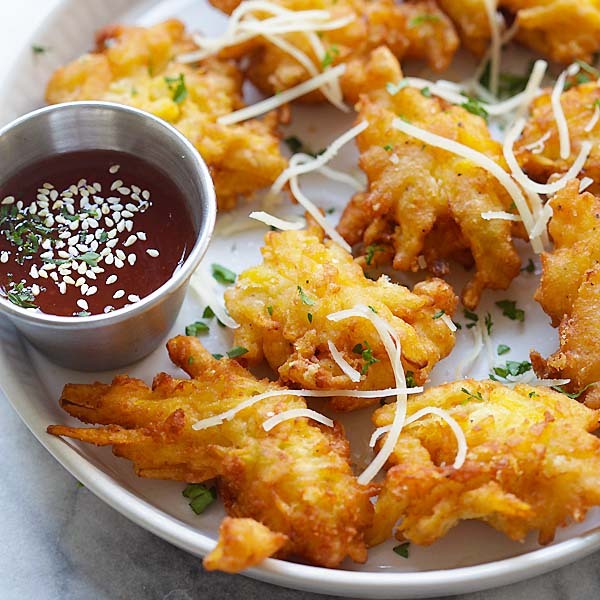 I am just so glad that someone invented the concept of air-frying and now we can air-fry anything, for example: fries, fish, chicken, nuggets and even spring rolls! Since I have gotten my new toy, I have been using it to make easy fried foods. One of my favorites is sweet potato fries, because it’s so easy to make, plus we really enjoy it as a side dish, especially my picky eater son. He also loves cheese, so I decided to make this Parmesan sweet potato fries for him a few days ago, just to jazz things up a bit. The end result is these beautiful, crispy sweet potato fries, not a bit oily. What I love most about the Philips Viva Digital Air Fryer is that you use so little oil—one tablespoon—and clean up is a breeze. After I am done, I just disassemble the frying basket and tray and off they go into the dish washer. As there is so little oil involved, there is no greasy mess…everything is easy breezy, and I love it. For sure, I know I will be using the Philips air fryer again and again and make the fried foods that I love, without feeling any guilt. Peel, rinse the sweet potatoes and cut into lengthwise strips. Soak in water for 30 minutes. Drain the water and pat dry with paper towels. 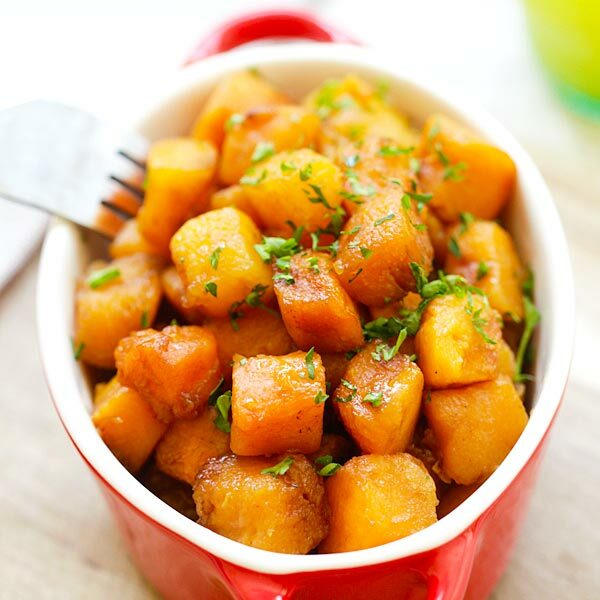 Place the sweet potatoes in a big bowl and add the olive oil and salt to the sweet potatoes and set aside. Preheat the air fryer to 330F. Add the potatoes to the cooking basket and cook for 5 minutes, until crisp. Remove from the basket and allow to cool on wire rack. Increase the temperature to 390F and add the sweet potatoes back into the basket and cook for 10-15 minutes. 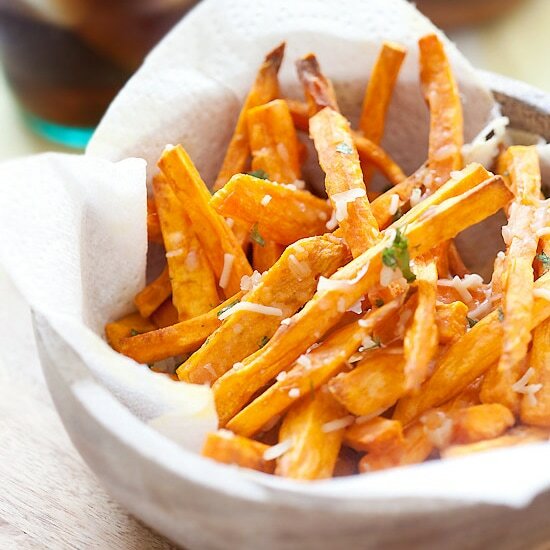 Transfer the sweet potato fries out of the air fryer and sprinkle the Parmesan cheese over the fries, mix gently and garnish with the parsley. Serve immediately. All photos and recipes on Rasa Malaysia are copyright protected. Please do not use the photos and recipes without prior written permission. If you wish to republish this recipe, please rewrite the recipe in your own words instead of copy and paste and link back to //rasamalaysia.com/parmesan-sweet-potato-fries/. Thank you very much! I bought a Phillips Air Dryer a couple of months ago and love it. I currently have my sweet potato strips soaking trying this recipe. The photo looks great and has made me want to try it. Funny, I never think of pairing sweet potatoes with cheese. But this sounds awesome! Thanks for sharing (and enjoy your new toy)! Wish I had remembered about this recipe, we just had sweet potato fries last night, saving this recipe. 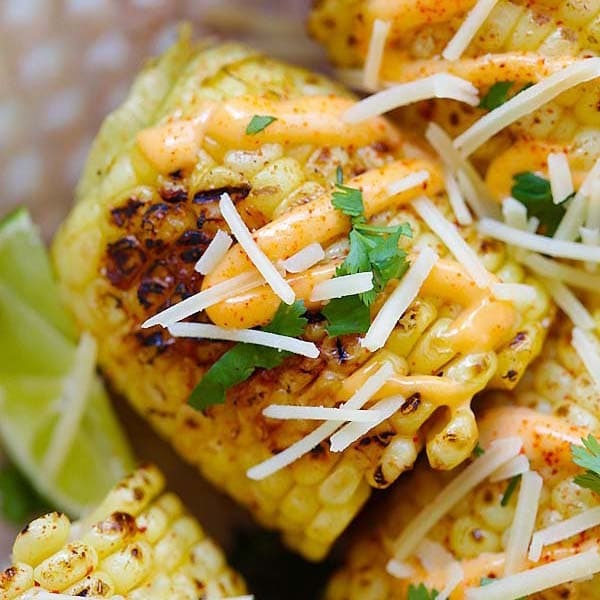 I’d never heard of an air fryer before seeing this recipe. I think there will be one in kitchen in the very near future! I like Parmesan Sweet Potato Fries .It’s very yummy . Thanks for sharing this delicious recipe . you have shared such an amazing recipe.thanks for the sharing.